Implants are man-made roots that are used when a natural tooth root is lost or damaged beyond repair. A natural tooth consists of a root and a crown. When you lose a tooth, you lose both the root and the crown. To replace the tooth, we must first replace the natural tooth root with a man-made tooth root — the dental implant. The dental implant is used to support a crown for a single missing tooth or a bridge if you are missing multiple teeth — or even all of your teeth. Once the implant is in position to replace your natural tooth, time is allowed for bone to fuse and anchor the dental implant. Your replacement tooth is provided the same day. Nobody is ever without a tooth in our practice. Using a variety of techniques specific to your individual needs, a new replacement tooth (crown) is placed on top of the implant. Dental implants can be used to replace a single missing tooth anywhere in the mouth. 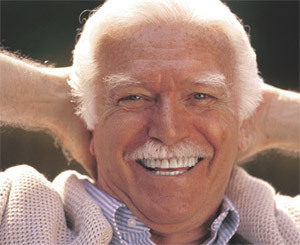 There are also implant solutions when you are missing many teeth. Even if all of your teeth are missing, there are a variety of treatment options available to support the replacement teeth. Current research shows that dental implants should last your lifetime. Using the most recent advances in dental implant technology, Dr. Sharifi is able to have his patients receive the most ideal protocols available today. Some options include placing implants the same day the failed tooth or teeth are removed, placing a temporary crown or bridge on the new implants the same day and eliminating subsequent additional surgical intervention. Dental implant placement is a team effort between an oral and maxillofacial surgeon, a periodontist and your restorative dentist. Dr. Sharifi has advanced training in prosthodontics and will perform the planning, provisionalization and final restoration. He partners with the best surgical dentists in and around Chicago for your dental implant needs.